Salesforce.org's Nonprofit Cloud and Philanthropy Cloud both partner with nonprofit organizations but in different ways. The uses of each are compared here. Nonprofit Cloud and Philanthropy Cloud are part of Salesforce.org -- Salesforce's philanthropy spinoff. Both clouds work with nonprofit organizations, but the way in which that happens is vastly different. Nonprofit Cloud is designed specifically for nonprofit organizations. This CRM for nonprofits, offered at a discounted price, enables charities to track missions from start to finish. Nonprofits can manage donations from pledge to payment and keep track of donor, volunteer and aid recipient details throughout the mission's lifecycle. Products within this cloud include Nonprofit Success Pack, Sales Cloud, Service Cloud, Marketing Cloud, Lightning Platform, Chatter, Success Plans and NGO Connect. Philanthropy Cloud is a joint effort between Salesforce.org and United Way, connecting employees in the workplace with more than 1.8 million tax-exempt organizations within the GuideStar database. This product is designed to increase employee engagement and enables businesses to track workplace giving on both individual and team levels. Employees are also able to create personal profiles within the Philanthropy Cloud network using Salesforce's Einstein AI. These profiles are portable, staying with employees through their lifetime as they move from job to job. Businesses also do not need to use the Salesforce CRM to have access to Philanthropy Cloud. The cloud service can be purchased separately through United Way. Salesforce.org was founded in 2008 as a means to cater to nonprofits, volunteers and educational institutions. Since that time, it has been divided into three cloud services: Education Cloud, Philanthropy Cloud and Nonprofit Cloud. Education Cloud started as a CRM customized for colleges and universities and is being expanded to include a tailored K-12 model. 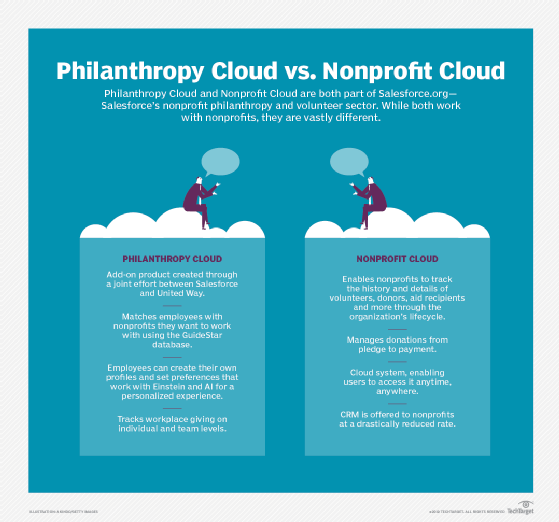 How has the use of Nonprofit Cloud or Philanthropy Cloud benefited your organization?